Key role in production of cellular energy. Derived form which provides greater neuro-protection. Deficiency associated with chronic fatigue. Significantly improves performance in endurance sports and reduces muscular stress after exercise. Sports enthusiasts, vegetarians and overweight individuals should opt to supplement with l-carnitine rather than the more expensive, cerebroactive' acetyl-l-carnitine, or at least combine the two. US nutritionist Robert Crayon, who has written a best-seller on this supernutrient', recommends combining l-carnitine and acetyl-l-carnitine in equal proportions. 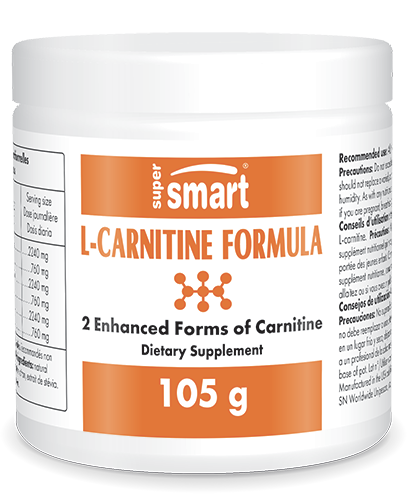 L-carnitine tartrate is a patented, non-hygroscopic and particularly stable form of l-carnitine. Each tablet contains 750 mg of L-carnitine tartrate. Take 3 to 6 tablets a day spaced evenly throughout the day.